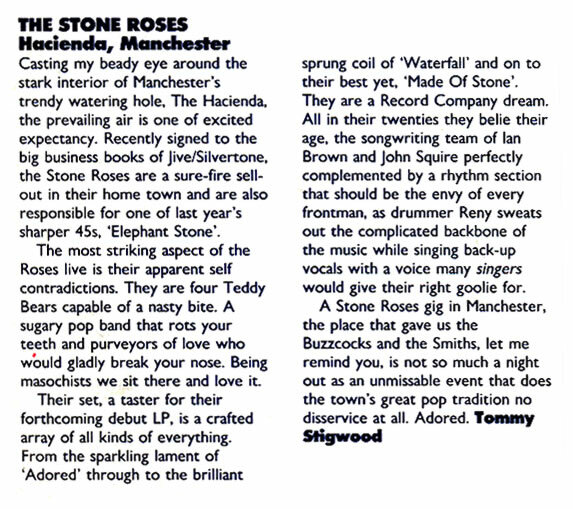 We find the Roses in belligerent form, yet the journo takes it well and is more than convinced by the Roses after seeing them nail it live. 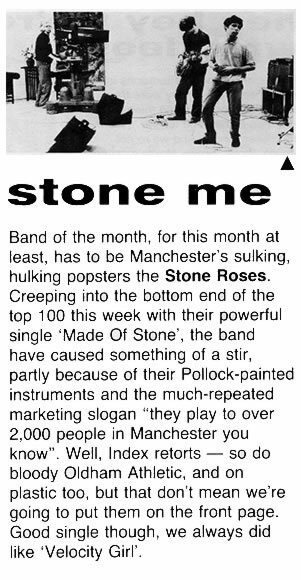 The article from Sounds March ’89 also features one of my all time favourite Roses photos that really captures the Roses’ gang mentality. 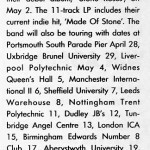 Another mystery clipping, although the dates don’t really matter too much here. 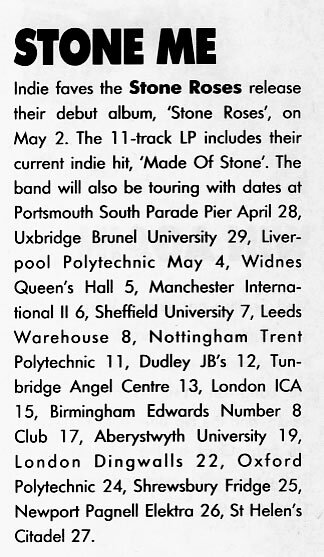 A Q & A from Melody Maker that takes a look at the various court cases that have plagued the Roses over the years. Bit of mixed bag today. Three clippings that I’ve lost the origins of. 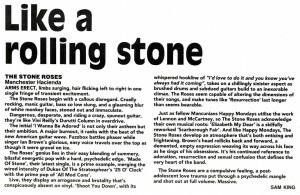 First up is a review of the Hacienda gig on 27 February 1989, then two news articles from the Record Mirror that I think were from February and April of the same year. If you can clarify the sources or dates then please leave a comment. 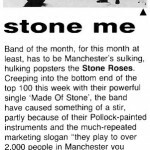 The second part of the new Stone Roses podcast series is available on iTunes. Highlights include new interviews from Ian Brown, Peter Hook and Bobby Gillespie. Check it out on iTunes or through Feedburner. Day 7 already. Is there more? Of course there is … lot’s more. 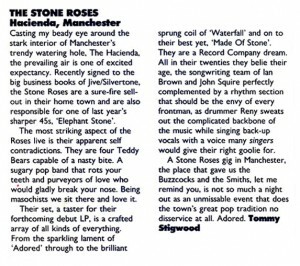 An enthusiastic review of the Roses’ Hacienda gig from 1989, just a couple of months before the album’s release. 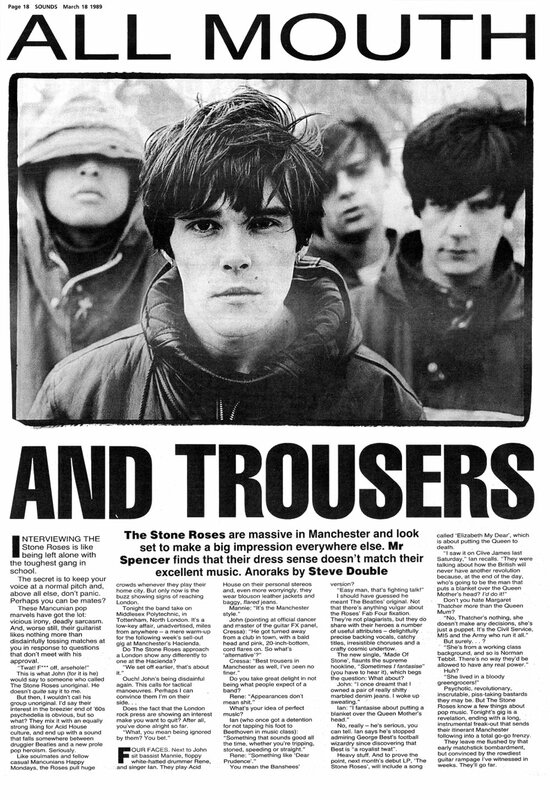 The Roses must’ve been on the top of the world knowing what a great record they’d just made. 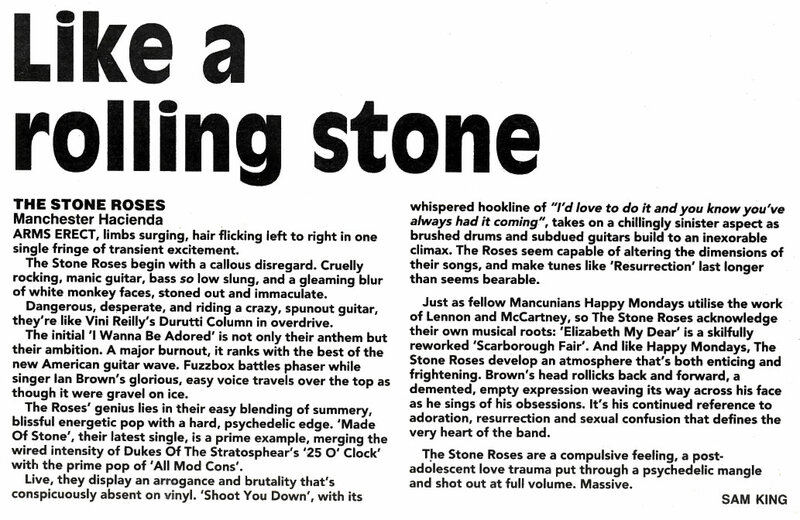 Despite their bravado they couldn’t have know just how great … surely?